At a time when there are cocktail conventions and beer and wine festivals galore, one could legitimately question the need for another. But when Angel Postell first hatched plans to launch BevCon, she saw the need for something different from what already existed. “At so many events, smaller producers get lost because they don’t have the same resources or opportunities,” as big brands, she says. “I wanted to give them an opportunity to have that option, so it’s not an overwhelming event where they don’t have enough resources to shine.” With its inaugural industry-focused event in 2016, BevCon brought together people from across the beverage spectrum, with distillers and bartenders joining winemakers and sommeliers, and brewers spending time with baristas in a kind of creative cross-pollination. A publicist and event planner specializing in food and beverages, with events like Charleston Wine + Food on her résumé, Postell also saw this as another opportunity to bring the beverage crowd to her native Charleston, the better to showcase the city’s restaurant and cocktail culture. Starting this year, Postell’s aiming further afield with BevCon moving to Los Angeles. She’s also aiming to bring voices from Europe and Asia to make BevCon more of an international conversation. 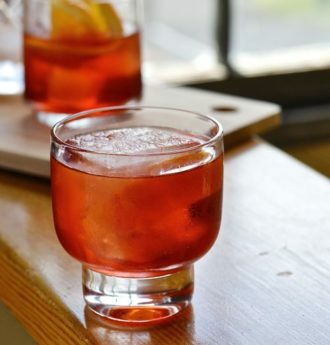 A pinch of salt makes flavors pop in this simply seasoned Negroni.